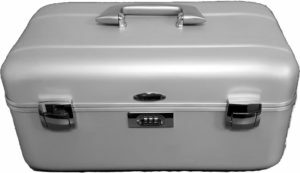 The Model TM-002B Flight Termination Test Set is a portable test set used for flight-line checkout of flight termination receivers and command receivers. 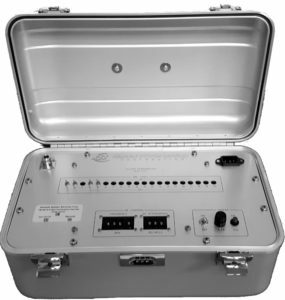 The test set accepts AC power and generates a modulated RF output suitable for interrogation of flight termination and/or command receivers. Internally generated command tones modulate the synthesized RF carrier to produce up to 6 dBm RF output. The IRIG tones can be individually switched on and off. The test set is provided with an AC cord for prime power input and a type N connector for RF output. Power on-off switch and indicator, as well as tone control switches, are located in the front panel.